Bashir and O'Brien risk everything for a chance to save Odo from the Changeling virus. Director Sloan surrounded by documentation of all the outlandish conspiracies his organization has engineered. Rigged Elections, Russian moles, obstruction of justice... you know, that kind of stuff. Kevin: My first question when pondering this episode is how effective is it to have an episode with such a narrow focus. All the other episodes in the final arc have pulled on the threads of life on the station, Bajor, and the Cardassian resistance. This episode is focused pretty exclusively on the Bashir/O'Brien story. Now, we've criticized the earlier parts of this plot for being in a holding pattern over a few episodes, so maybe it would have been better if they had just held off entirely on this storyline until this episode. Also, I'm not saying we needed some superfluous Dukat/Winn filler. It's just that it feels like a bit of a tonal shift to go from winging around the galaxy to literally the confines of one man's mind. Matthew: I like the narrower focus. I have found that some prior parts of this finale arc have suffered from a bit too much of a scattershot approach. I would have preferred to see longer stretches on each plot, perhaps only an A and B story per episode, instead of the ABCDE structure we've gotten. Is this one too tightly focused? Maybe. But it's a nice break. I do agree, however, that for the most part, all prior scenes in this particular plot could have either been dispensed with or confined to this teleplay. Kevin: Because the episode has one thread, success is pretty dependent on it. In that, I think episode does OK, but not more than that. I find Bashir's logic pretty flawed in assuming that there 1) is a cure at all and 2) that the person sent to destroy it would know it. Wouldn't it be prudent to teach an agent just enough to know what to look for without having such a valuable piece of knowledge? And given the vast differences between changelings and humans, there had to be a pretty low risk of crossover, so I could easily see Section 31 not bothering with a cure. As "mind episodes" go, this one had a minimum of slow cam or overt attempts at dream imagery, so I'm at least not annoyed. I saw the dream within a dream solution about a parsec off, but what are you going to do about that? Matthew: Indeed, that logic is a bit tortured. I'm willing to overlook it because it have us a fun, truly sci-fi plot, which we haven't had for a while, honestly. Other logic issues: why does Sloan walk around in a sinister black leather cloak? Why does Sloan's preferred suicide method allow hour upon hour for brain infiltration - a long enough time to devise and implement an entirely new technology? Kevin: I think the episode succeeds the best in drawing on the Bashir/O'Brien friendship and how tempted Bashir would be to gain access to Section 31's knowledge. The friendship has been one of the gravitational centers for the main cast for several seasons now, and the writers clearly see the pair as something of an avatar for expressing their own views on relationships. I think they laid it on a little thick at the end, but I liked how honest they were about how close they had become. I think the world would be a much better place if men felt comfortable acknowledging their need for emotional intimacy and someone that they can be vulnerable in front of. seeing his estranged wife. You know what would have made this episode a 5 in my book? If it had been a flashback, set on Earth or something, of Sloan's recruitment, with Bashir as a witness. I'm imagining something similar to "Tapestry" here. It could have given Bashir a different side to the story he's written off as evil. Kevin: The Last Temptation of Julian Bashir would have also made a better focus than the mechanics of sussing out the cure. Bashir was willing to commit some fairly illegal actions to save his friend, and while I'm not saying that's equivalent to genocide, I think there's an argument about the difference being merely one of scale. The thread underlying the fear of genetically modified people is that their "superior ability will lead to superior ambition" and it would have been fun to explore that. Working with Section 31 would be like working with the genetically modified patients in Statistical Probabilities times a billion. More information, more resources, fewer scruples. I think the episode would have be better served to really dig into how, beyond just the mere playing at espionage fantasy, Section 31 offers Bashir a chance to be himself without limitation. 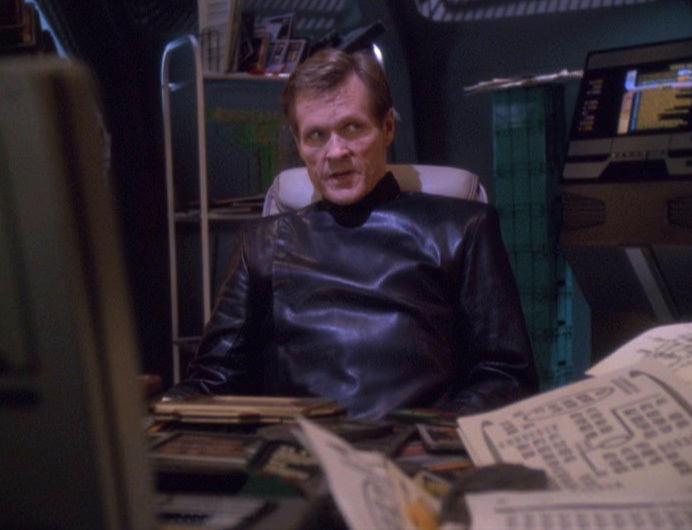 Also, while I LOVE William Sadler, it would have been fun, at least at first, to have the agent turn out to be one of those genetically modified people recruited by Section 31. Having to use his mind probe on Patrick or Sarina would have been a fun twist. Matthew: Yeah. I agree there were missed opportunities here. In addition to the backstory elements we have both mentioned, they could have gone into creepier territory. They did it with the slurred speech, and they did it with the faux-escape fakeout from Sloan's head, but could have gone even more surreal with what a dying mind feels like (and no, I'm not advocating clowns and jugglers with minimalistic backdrops). Kevin: Sadler does good work here. He's at his best at quietly menacing, but seeing the kinder, middle management Sloan with his family was well played. Beyond that, I don't think he got a lot to do. Most of his scenes were about advancing the plot, not really working on the character side of things. I got the impression he didn't quite know how to approach that final scene on the bridge. It was so oddly staged that I kind of can't blame him. Matthew: Sadler is great. His best episode was "Inter Arma Enim Silent Legis," and that was because he got to play all different sides of the character, and to be really manipulative. Some more face to face time with Bashir, giving him some of the upper hand, would have been a boon here. Because he was good in what he was given. Kevin: Meany does the yeoman's job of...well...being the yeoman here. I think both he and Siddig were at their best when they were talking about their relationship. The espionage elements of the story provided the least for them to do, so when they actually talked about their feelings, it was at least something for them to bite into. Matthew: Alexander Siddig has one of his better episodes, here. His outrage isn't too pitched, which has always been the actor's downfall to this point. I enjoyed his friendship scenes with Meaney, but I would say his best stuff was arguing for staying in Sloan's mind to retrieve information. Kevin: There have been times where the use of the empty station has felt a little like a cop-out, but I will say in its favor, we had no weirdly drawn out or foggy dream sequences. It was more a series of jump cuts that were largely effective. Matthew: This episode wasn't boring visually. Not scintillating, either. But not boring. And you're right, so many "mental" episodes in DS9 have tended that way. Kevin: I kind of wish the final scene hadn't taken place on the Defiant bridge. It would have been more interesting as some secret actual archive. Or some place relevant to Sloan. I understand why our characters would interpret everything as DS9 and the Defiant. I wish we had gotten a bit more of Sloan's life in their to make the imagery more interesting. Matthew: Yeah, this goes back to what I think the theme of the show should have been. Some sort of location crucial to Sloan would have been much more evocative. I did, however, like all the documents they had strewn about. Kevin: I am stuck between a 3 and a 4. I am solidly diverted for the whole episode, but I feel like it never transcends some fairly expected tension (Maybe NOT getting the cure would have been the shocking twist) and some pretty straight forward tricks you expect to see in stories in someone's mind. They're still in the dream? No. I just can't believe it! That said, everyone did a solid job acting wise, and we got some nice, if not heavy-handed acknowledgment of Bashir and O'Brien's friendship. I think in the balance, this is a 3. It's not bad, but it's not my favorite of the finale arc, either. Matthew: I am also wavering between 3 and 4. I applaud the ambition and focus of this episode. But I agree and acknowledge that so much more could have been done. For me, the lack of truly creepy tonal elements keeps this in average territory. Meaty flashbacks could have elevated it even further - if you're going to end the Section 31 story for the foreseeable future, give us some serious background! So I agree with the 3 for a total of 6. I like the idea that the knows the cure, and most in Section 31 does, because they really don't want to commit genocide and they all have the ability to shut it down if a golden opportunity presented itself (like, say, the Dominion stops trying to conquer the galaxy with their brutal theocratic regime).